Instant Income App, also known as Millionaire Trader found at millionairetrader.biz is a binary trading software scam. Read this review as we uncover the truths behind Instant Income App scam. The alleged owner of Millionaire Trader and Instant Income App, Matthew Michaels makes a huge boast in his sales video right off the bat. He showed multiple raving testimonials by his so-called members, and goes on to talk about how he has developed Instant Income App to take advantage in the loopholes of financial markets all over the world. Is he telling the truth? Unfortunately not. In fact, there are many red flags in the homepage of Instant Income App scam that you should take note of. The first one is the highly exaggerated and unsubstantiated headline that Matthew uses in the homepage to catch the attention of internet users like us. You’ll know why the profit shown in headline is fake in the later part of this review. The headline has only 1 purpose – to entice you into watching his entire sales video. 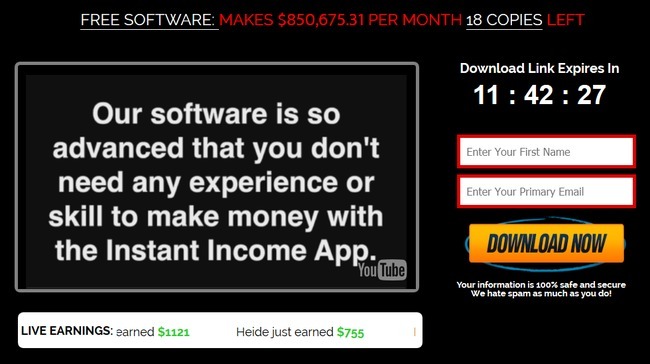 In the sales video, Matthew tries to brainwash you into thinking that there is easy money to be made online with fully automated softwares such as Instant Income App. Let me tell you this – I’ve been a victim of various binary software scams before. There is no free lunch in this world. Not to mention the fake countdown timer found to the right of the sales video. You can tell it’s a fake either by refreshing the page (the timer will reset), or by letting it run out. You’ll realize that you can still access the system just fine. The countdown timer is just there to force you into action. Alright, now let’s look into the members review of Instant Income App. The video reviews by real people can’t be fake, right? There are a few members who are giving raving reviews for Instant Income App because it makes them a boatload of money. The members you see in the sales video of Instant Income App are actually actors and actress found in Fiverr.com. 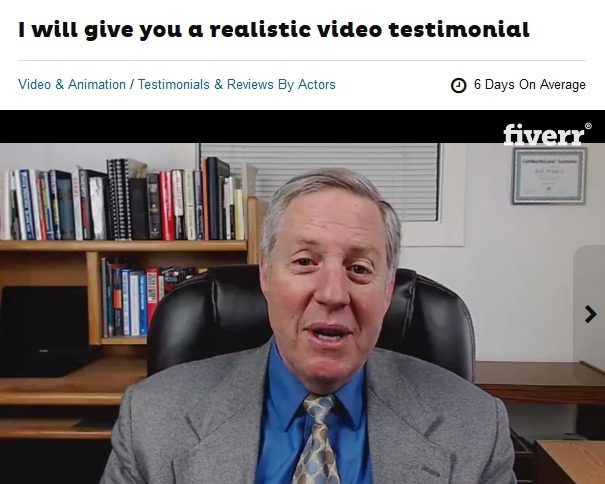 They read any script given by their clients like real testimonials for as low as $5. This is called buying a testimonial. The positive reviews you see in Instant Income App scam are all fake testimonials. I do not condone or condemn the act of buying and selling fake testimonials, but I want you to be aware of this – that fake testimonials can easily be bought online. There are more conclusive proofs to show that Instant Income App is a scam. We’ll reveal it at the later part of this review, as well as guiding you to the real way to make money online. Since this is a binary software scam, I think it’s necessary to talk about how it works to make sure everyone is on the same page. If you have experience trading binary options, feel free to skip to the next section. Binary trading is basically trading stripped down to its simplest form. Unlike stocks and Forex markets where you need to analyze charts and stay on top of financial news, you only need to choose “Yes” or “No” in binary options. You trade by guessing if the price of an asset will rise or fall after a short period of time, usually between 30 seconds to minutes. Here’s how it works – let’s say I think that the price of oil market will rise after 60 seconds, and I bet $50 on a 1-minute contract. When the time is up, and the price is indeed higher, I win a certain percentage of what I bet, usually between 60% to 80% ($30 to $40). But if I’m wrong, I lose the entire $50 that I have invested. This makes binary trading not that different from gambling. There’s no way to predict the market movement in such a short period of time, let alone getting it right consistently. Can you guess the outcome of a coin toss with confidence? The odds is almost at 50-50. The same principle applies to binary options. Even if you manage a 50% win rate, you’ll still lose money due to the uneven winning vs losing payout of binary options. This is why majority of binary traders lose money, and the difference in payout is how brokers make money off them. The truth behind Instant Income App scam. But how many people actually read it? 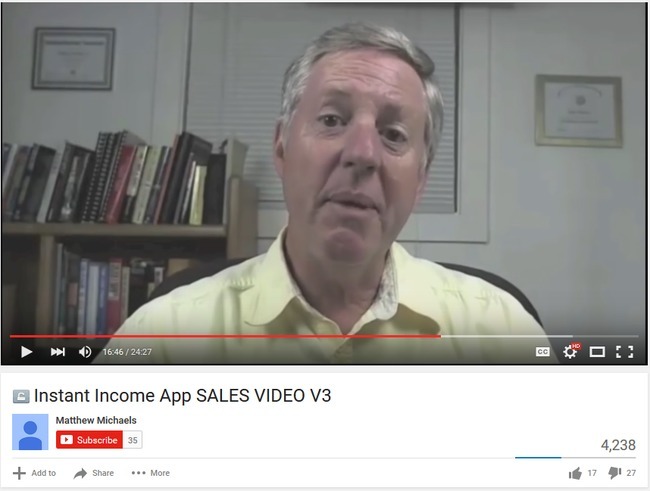 In the entire sales video of Instant Income App scam, never has once did Matthew Michaels talk about the possibility of losing money with his app. However, if you take time to read through the risk disclaimer at the bottom of his sales page, you will realize that Instant Income App is not hyped as Matthew wants you to believe. Clearly understand this: information contained in this product are not an invitation to trade any specific investments. Trading requires risking money in pursuit of future gain. That is your decision. Do not risk any money you cannot afford to lose. Instant Income App admits that trading binary options is highly risky, even though they made no mention of it in the sales material. If you decide to use the app, it’s your decision and you are on your own if you lose all your money. All the results shown in the sales materials are simulated. THERE ARE NO ACTUAL TRADES DONE WITH THE SYSTEM. To put it simply, all the results shown are not real. Fact #2 alone should be enough to alert you and steer you clear of this scam. These terms are not included as a fair warning for you. The sole purpose is to protect the scammers from legal actions when you lose all your money using Instant Income App. If they wanted to be honest about the risks of trading binary options using their software, they would’ve warned you in the sales materials. Instead, they chose to present to you false promises and fake testimonials. If you decide to sign up with Matthew’s Instant Income App, you’ll have to register for a broker account through his sales page (which is an affiliate link). Matthew and the scammers will earn a sum of referral fees as soon as you make your first deposit. I was assigned to Binary Book, an affiliated broker with Instant Income App. The minimum deposit with Binary Book is $250. You may be assigned to different brokers depending on your country and location. The standard minimum deposit for most of these brokers is $250. Even if you already have an existing account with your assigned broker, you will need to register for a brand new account using a different email address. This is because the scammers behind Instant Income App cannot earn their referral fees if you do not sign up through their affiliate link. Is Instant Income App a Scam? YES, INSTANT INCOME APP IS A SCAM. As we’ve said in the review earlier, we don’t recommend binary options trading as a way to make money online, at all. It’s not that different from gambling, and using an automated trading software is no different. You are essentially putting your hopes and entire investment in a piece of software that gambles on your behalf. YES! Instant income Ap is a 100% Fraud SCAM and the grossly incompetent actor needs to be charged with US Mail Order Fraud and sentenced to 10 years in prison along with his friends who hired him! sorry, what I mean is.. Is it safe to leave our information in the profile? because we had given them the details and cards numbers..
Hi Intan, once you’ve submitted your information, there’s no way for you to remove it. The best you can do is to monitor your account for any unauthorized charges, and don’t ever agree to fund your account if you receive calls from their sales team. what a load of crap…..these people should be sent to prison…..FRAUDSTERS….I HOPE THEY RING ME IL PLAY THE GAME AND THEN TELL THEM TO GO DO 1….bet they push it on there family members to…they all scum!!!!!!!!!!!!!!!!!! i thinks is not real..i try find back,whr’s the website..no such..things..coz i want to deleted my profile’s there..
As per my reply to aga, there’s no way to delete your profile there. However, you can choose not to deposit any money into your account. I’ve opened the account in their website, but when I saw an information, that Ineed to deposit my money, the red light in my head appeared. I don’t want there any profile, but I don’t know how to delete it now and remove all my details from there. Unfortunately I don’t think there’s a way to delete your account online. However, you’re lucky that you haven’t deposited any money in your trading account. You may receive calls from the broker and you may be offered trading bonus if you deposit. Just stand your ground, don’t deposit and you’ll be fine.